Pakistan Navy invites application twice in a year for recruiting PN cadets. Interested candidates have to register themselves online within the due date. For online registration you will have to visit the link given below. 1-Candidates should be a male unmarried citizen of Pakistan. 2-For civilian candidates required age limit is between 16 1/2 to 21 years on the cut off date. Required age limit for any serving candidate is from 17 years to 23 years. 3-Minimum required height for candidates to join Pak navy as PN cadet is 5.4 inches. Candidates of O/A-Level need to submit equivalence certificate issued by IBCC. If you are FSc part 2 student and have got minimum 65 percent marks in FSc part 1 exam then you may also apply to join Pak navy as PN cadet. Such candidates need to furnish hope certificate from the principal of your current college. Candidates from province Balochistan will be given 10% relaxation in minimum required marks in FSc and A-Level. It means Baloch candidates just need to get 50% marks in FSc or A-Level. For online registration visit the above mentioned link and follow the given instructions. Candidates are not allowed to send their applications directly to recruitment directorate of Pakistan naval headquarters. All directly received applications on recruitment directorate at NHQ will be rejected. 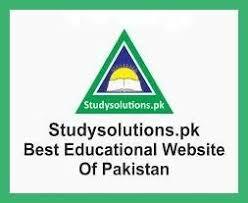 After online registration you are directed to bring postal order of three hundred rupees. Postal order should be drawn in favor of director of recruitment NHQ. After registration within 2 weeks you will have to appear in entrance exam. Entrance tests are of 2 kinds ie intelligence test and academic test. Duration of intelligence test is 30 minutes whereas duration of academic test is 80 minutes. Academic test will be about English, Math, Physics and GK. 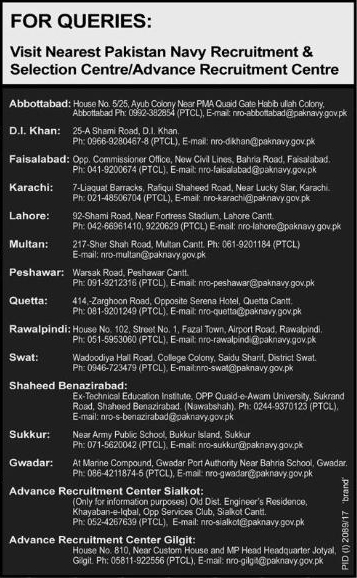 Then entrance test result will be displayed at www.joinpaknavy.gov.pk and your nearest PNR & SC. Now comes the stage of preliminary interview and medical test. Form for this preliminary interview and medical examination will be issued to only those candidates who will clear the entrance test. Candidates are directed to get their ears and teeth cleaned by any specialist doctor and dentist. For preliminary interview and medical examination you will be called at your nearest PNR & SC. Now you will have to appear in ISSB for final test and interview. 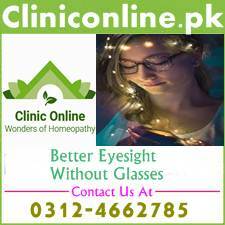 If you are recommended by ISSB then you will have to appear in your nearest CMH or Naval hospital for final medical test. In the last NHQ will issue the list finally selected PN cadets. Read our following articles for more guidance about joining Pakistan Navy. For future prospects, benefits and ineligibility terms read the details in the picture given on this page. 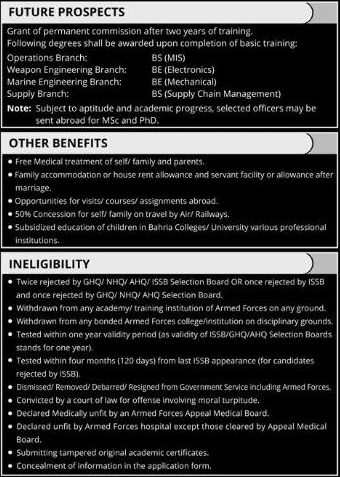 For any further query kindly visit your nearest Pakistan navy recruitment & selection center/advance recruitment centers. List of these centers has been given below.